Unfinished capriccio showing the interior of a curved building with thermal windows and relief panels alternating in an attic storey above three-bay niches with a triumphal arch with niches containing sculpture in between. 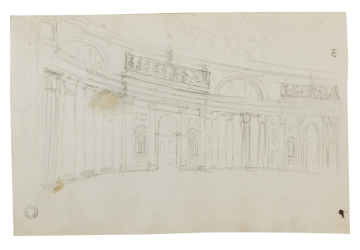 You are here: CollectionsOnline / Unfinished capriccio showing the interior of a curved building with thermal windows and relief panels alternating in an attic storey above three-bay niches with a triumphal arch with niches containing sculpture in between. Black chalk and pen capricci of two plans. The larger is unfinished and shows a building with rectangular spaces adjoining an oval hall with screened niches; this plan probably relates to the elevation on the recto. It is derived from a small symmetrical plan with circular hall and four rectangular spaces seen elsewhere. The small plan in pen may be compared with those on the verso of Adam vol.9/69. The style of the interior, which is loosely based on those of the Pantheon and Santa Maria degli Angeli in Rome, can also be found in several chalk drawings in this volume (see Adam vol.55/78, 80, 118, 143 verso and 145).